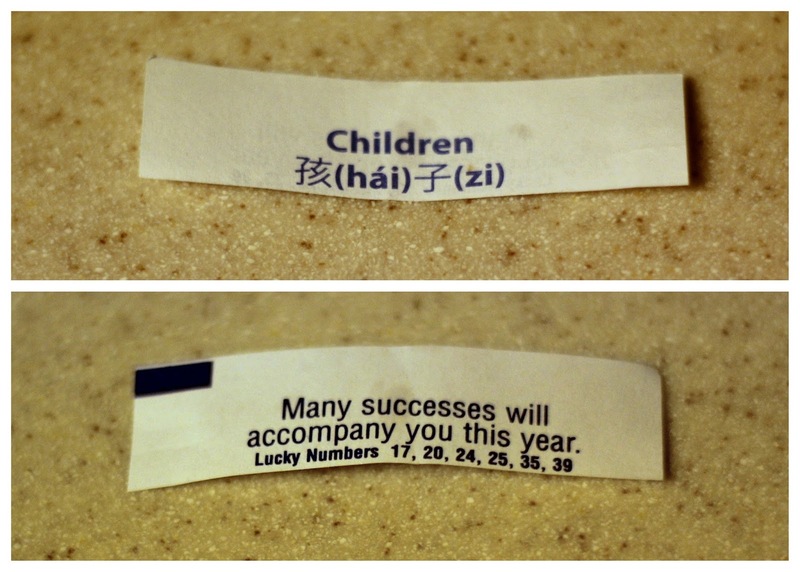 Fortune cookies have always been a source of entertainment after eating a delicious Asian meal. On the exhausting day my Mom was diagnosed with cancer, we ordered local Chinese food take out for dinner. We each opened up our fortunes and read them to one another. Then it was my mom's turn to read hers. She cracked her cookie open, and realized it was empty. There was no fortune for her. I saw the look on her face. She laughed it off, but it gave all of us the chills after all that had happened that day. And sure enough, a few months later, she died. Do I think it was a real prophecy of the future? Of course not. But it was weird and always stuck in my mind. Fast forward to tonight where I am 1dp6dt. Kevin and I went out to PF Chang's. As I cracked my fortune cookie open, I joked "Wouldn't that be funny if my fortune cookie said 'you're going to have a baby' or something straight-forward like that?" I got the chills, only this time they were good chills. Wow! What an awesome sign! Did you play the lotto too? Me too! This one just blew my mind! Wow girl that entire story bought tears to my eyes, this is a good sign for you! Thanks, Geordie! I sure hope so! Well okay then! I hope this fortune cookie really is telling the future! Wishing you all sorts a luck! That gave me the chills and I teared up when I saw it! Looks like a great sign to me!! A short while before I found out I was expecting my first I opened a fortune cookie that said "A little surprise is on it's way to you". I had no idea I was pregnant and when I found out a week or so later that I was expecting, I'd wished I'd held onto that fortune for her baby book!